(THE STAR/ASIA NEWS NETWORK) - Bubbly and exuberant with a ready smile, Ms Atiqah Nik Ghazali is completely at ease in the kitchen, where she ladles out hot spoonfuls of nasi goreng ulam from a large wok into her mother’s treasured Noritake serving bowls. This charming scene is a recurring theme for Ms Atiqah, who grew up in a family of good cooks and started developing her culinary skills as a teenager. As a child, she had fond memories of her “balik kampung” trips to Kelantan where food was a highlight. Her grandmothers especially played a huge part in shaping her love of food, as both were excellent cooks. “Once or twice a year, we would go back to Kelantan and I would be exposed to nasi kerabu, laksam and all the different kueh. So I started to really like what I tasted during my childhood years,” she says. Both her grandmothers died quite suddenly (11 days apart of each other) when she was in her early 20s and her longing for them and their food intensified. “When you miss someone so much, you really want to taste her food. I would often ask my aunties for the recipes. But with the older generation, when you ask them, ‘How do you cook this?’, they will say, ‘Ah, sini sikit, sini sikit.’ They don’t really have the measurements. So now with technology, I can actually use the recipes my aunties gave me and Google for inspiration on how to adapt it to the taste that I remember,” she says. Although she is passionate about cooking the Malay food she grew up on, she is also a realist and advocates shortcuts and modifications, as she works full-time in sales and marketing and understands that some recipes can be particularly time-consuming. Take, for example, her nasi goreng ulam, which is a simplified version of nasi kerabu. “If you want to make nasi kerabu, you need a team. One to prepare the rice and ulam-ulam, another person to make kuah kerabu and someone else to make keropok and solok lada (stuffed green peppers). And if you want the real kerabu, you need 10 types of herbs and they are hard to find here, so I make this instead,” she says. 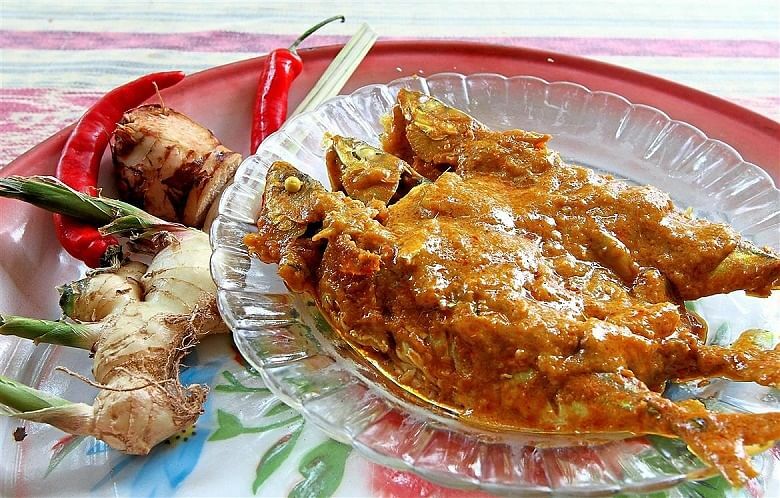 Her flavourful ikan percik has also been modified and represents her rendition of the dish. “It’s a simplified version of the authentic Kelantan version,” she says. She grew up eating her grandmothers’ delicious Kelantanese food and has since learnt to make many Malay dishes from around Malaysia. After getting married a few years ago, she inherited an even larger arsenal of recipes from her mother-in-law, who is also a fabulous cook. In fact, right after she got engaged, her mother-in-law shared her treasured recipe for rendang Taiping with her. 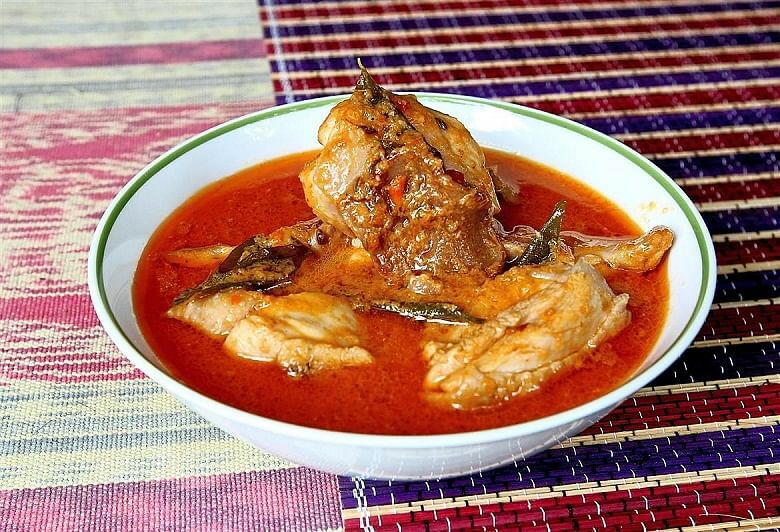 The deliciously rich, slightly sweet curry apparently has its origins in Penang’s rendang mamak, but was adapted when the family of her in-laws moved to Taiping, Perak. The recipe was then passed down to her mother-in-law who, according to family lore, is the only one of her 13 siblings to make it exactly like her mother. “It’s my husband’s favourite and, even during Raya, my in-laws’ family will come to my mother-in-law’s house and there will be requests for rendang Taiping. It’s her signature dish,” says Ms Atiqah. Her recipe for puding buih, meanwhile, is inspired by her maternal grandmother, who moved around Malaysia as her husband was a policeman. The pudding is from Pahang and is a jelly concoction with a sweet, milky custard accompaniment. 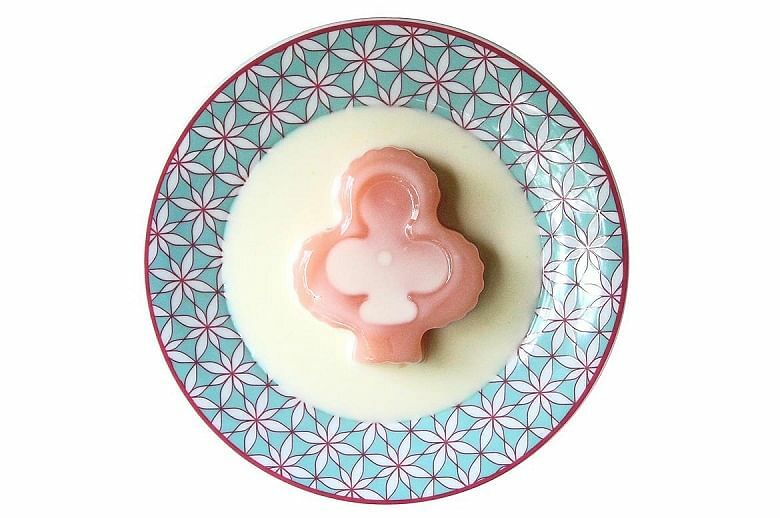 “It’s very rare to find puding buih anywhere, even at Ramadan bazaars. There are thousands of jellies, but none have that special taste, so to me, this is special,” she says. As she works full-time, she makes it a point to cook every single weekend. “When you work, you don’t care what kind of food you eat – you just eat because you’re hungry and you need something fast. But I get tired of everyday food, so over the weekends, my husband is home and I actually want different kinds of dishes. So I will cook it,” she says. She says she will continue cooking these Malay dishes as not only do they form the fabric of her childhood, but they also represent heritage food that is slowly dying off. “I see food as another element of a culture. You need to know how to cook traditional food or a similar version of it. Mine is a bit of fusion, but you need to know how to make it because otherwise it will die off. 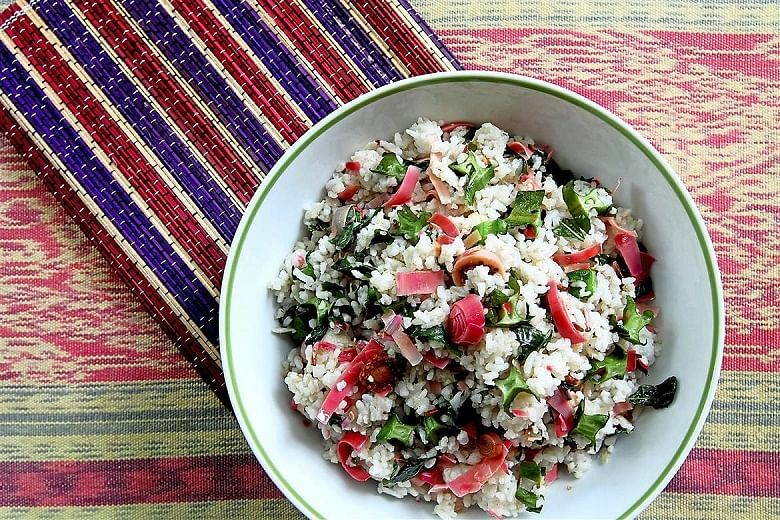 And because it’s traditional food, it’s important to keep the heritage going,” she says. 1. In a wok on medium heat, add oil and garlic and fry, making sure not to burn the garlic. Pour in the cold rice bit by bit. Keep stirring to break up clumps. Then add, one at a time, the winged beans, torch ginger and Vietnamese mint leaves into the wok. Stir until everything is combined and the winged beans turn a dark green. 2. When the rice crisps up slightly, add salt and pepper to taste. Mix well and turn off the heat. Serve hot. 1. Blend all the ingredients for marinating (except fish) in a blender. Pour the blended mixture on the fish and marinate for at least three hours. Once done, take out the fish and put in a separate container. Set aside leftover marinade. 2. In a deep pan over medium heat, add oil. Once oil is hot, add leftover marinade and stir well. Lower the heat and add chilli paste. Stir constantly until the chilli darkens, but do not burn it. 3. Once the mixture reaches pecah minyak (a layer of oil emerges), add coconut milk and stir. Then, add the turmeric powder, lemongrass and sun-dried asam keping. Stir until thoroughly combined. Add water, salt and sugar and stir well. Then, slide in the fish. Cook for six to eight minutes on each side and only flip once. When done, serve hot with rice. 1. In a food processor or blender, blend all the ingredients for blending and set aside. 2. In a large pot over medium heat, add oil. Once the oil heats up, add the aniseed and curry leaves and stir for a short while. Carefully pour the blended ingredients into the pot. Stir well, then add the chilli paste. Once it turns darker and you get pecah minyak (a layer of oil emerges) from the chilli mixture, add the coconut milk, water, asam keping and palm sugar. Mix well. 3. Once the gravy starts to boil, add the chicken, piece by piece. Then add salt and sugar. Cook for four to seven minutes on each side, trying not to flip more than four times. Once done, serve piping hot. 1. To make the jelly: Place a deep pot over a medium-heat stove. Pour in the water and agar-agar. Once the jelly dissolves in the water, add the sugar and syrup. Remove from heat and transfer the jelly mixture to another bowl. Put the bowl in an ice bath to hasten the cooling process, but keep an eye on it to ensure it does not harden. 2. In a mixing bowl, whisk the eggs with vanilla essence until it expands and is light and airy. Once done, slowly add the egg mixture bit by bit into the jelly. After everything is combined, pour the pudding mixture into individual cups, glasses or moulds. Leave to refrigerate for three hours or overnight for best results. 3. To make the custard: In a saucepan over medium heat, heat the milk and vanilla essence. Remove the pot from the stove once the milk bubbles at the sides. 4. Combine the egg yolks, corn flour and sugar in a small bowl. Add it to the milk mixture bit by bit, stirring continuously. Once the egg yolks have dissolved in the milk mixture, reheat the pot until it reaches boiling point. 5. Once done, remove from the heat and transfer to another bowl. Place bowl in an ice bath or refrigerate in the fridge, sealing the mixture with cling wrap. Serve with jelly once done.